Latest: The result for UPSC NDA 2 2018 has been announced. Check it from the direct link below. Register for SSB within two weeks. As the written examination result announced, So Commission will very soon issue the admit card for SSB interview. The SSB interview will start from January to April. The final result will be released in the month May 2019. UPSC NDA 2 Result 2018 Announced! If the above link doesn’t work then click here to download the UPSC NDA 2 Result. 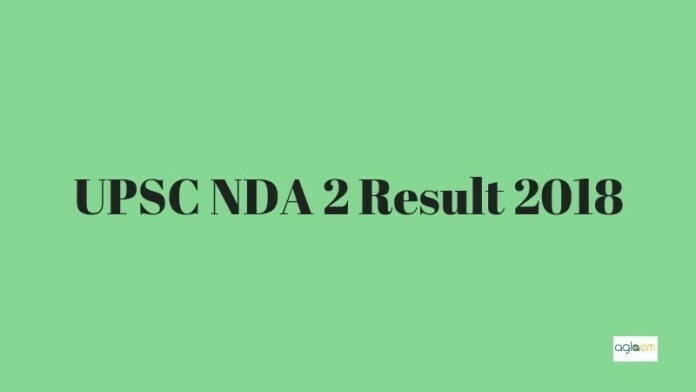 How to Check NDA 2 Result 2018? UPSC has published the NDA 2 2018 result of written exam and SSB as merit list. Score and cut off will be published separately. Candidates can check these after the announcement of the final result. Follow steps given below to check UPSC NDA 2 Result 2018. The NDA 2 result will open in form of pdf on a computer screen. Now press Ctrl + F and type your roll number, as the result file will contain the list of roll numbers of all selected candidates. If you are selected then congratulations to you. The candidates who are rejected do not distress, you have many other opportunities if you wish to pursue the Defense. For Graduation Level: There are options of Combined Defense Services, AFCAT for Air Force, Indian Navy UES for Navy. 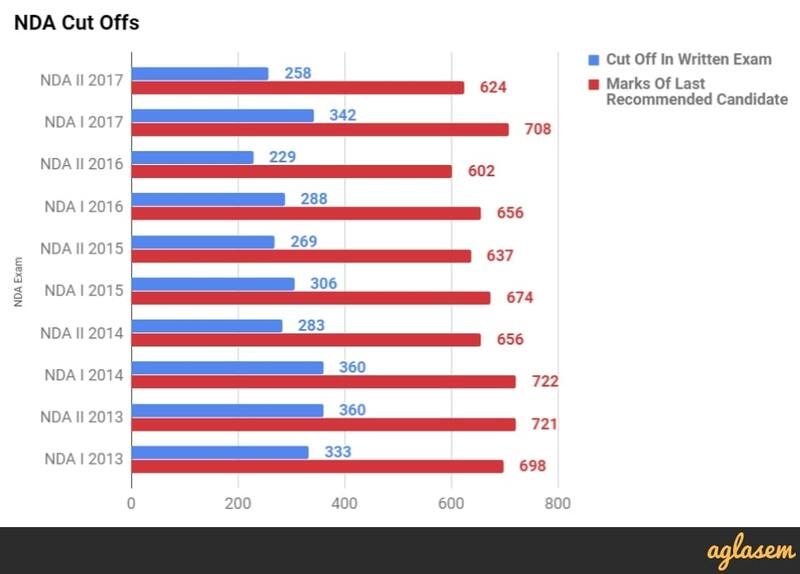 UPSC defines the cut off marks for written examination and final cut off marks. All the past year cut off marks for NDA 2 is here. secured 40% marks in SSB test. 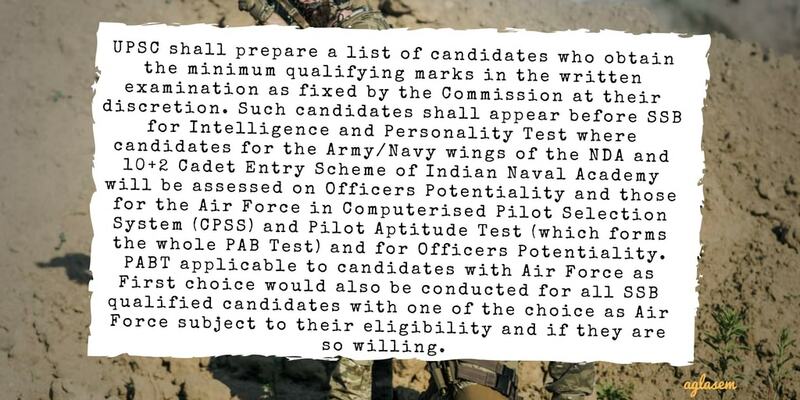 The selection process of National Defense Academy includes the written examination and Service Selection Board interview. UPSC NDA NA Written Exam: The written exam comprising of GAT (General Ability Test) of 600 marks, and Mathematics of 300 marks. Candidates who obtain cut off marks are declared qualified in NDA 2 2018 Result of written exam. SSB test and interview: Those who qualify in the above exam are called for SSB interviews. Candidates for Army / Navy of NDA and INAC will undergo assessment for Officers Potentiality. Whereas those for Air Force will go through that as well as CPSS (Computerised Pilot Selection System). There are 2 stages in SSB (stage I and stage II). In stage I of SSB there is the test called PPDT Picture Perception and Description Test and OIR (Officer Intelligence Rating). The stage II of SSB round comprises of Interviewing officer (IO), Group testing officer (GTO), Psychologist test. After final selection, the number of candidates will be selected is given here in the table of vacancy.